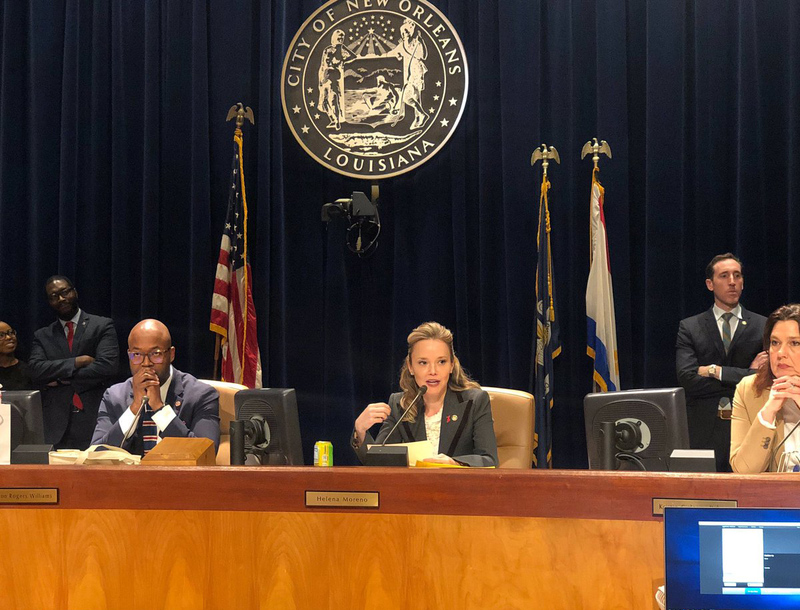 Additionally, the Council deferred action on a measure concerning Entergy’s use of paid actors in connection with the approval of the New Orleans Power Station and withdrew Ordinance No. 32,523 regarding possible updates to the City’s Alcohol Beverage Outlet ordinance. The council unanimously passed an ordinance to define school buses and create a category of permits, or Certificate of Public Necessity, in an effort to create a uniform regulatory and inspection framework for school buses citywide. District C Councilwoman Kristin Palmer, who heads the and Transportation Committee, stated that for the 2018-19 school year, New Orleans was using more than 60 third-party transportation operators, which makes regulation challenging — placing New Orleans children at risk as a result. The ordinance approved by the Council on Feb. 7 will require registration and permits in addition to subjecting drivers to drug tests, inspections, background checks and other common-practice procedures. 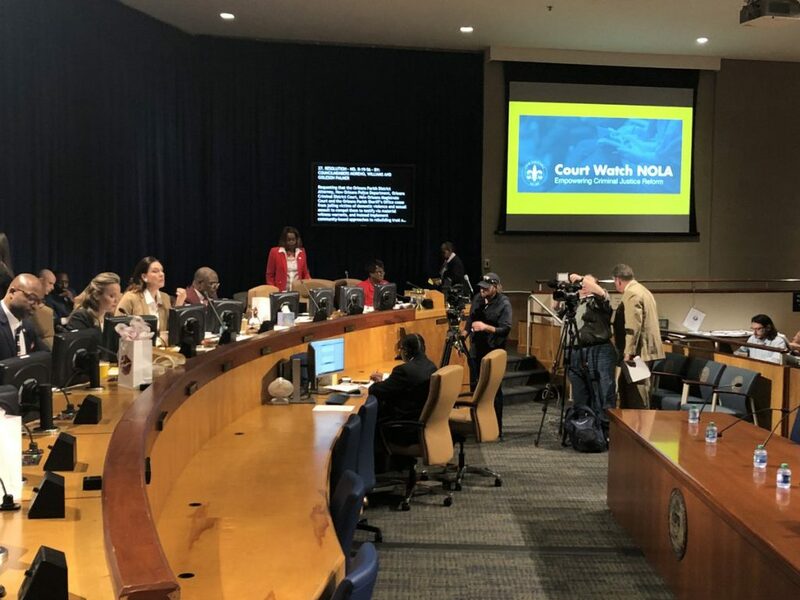 The Council received a presentation from Court Watch NOLA and adopted a corresponding resolution calling upon Orleans Parish criminal justice entities, such as the District Attorney’s Office, Sheriff’s Office and Police Department, among others, to end the the practice of jailing victims of domestic violence and sexual assault as a means of compelling them to testify. “At the end of the day, jailing victims sends the message that our criminal justice system is not here to help and protect but cause even deeper harm, and we absolutely cannot stand for that,” said Councilwoman-at-large Helena Moreno. Per the presentation, these practices have a wide range of detrimental effects including decreased confidence in law enforcement and further traumatizing victims who then re-enter the system as criminal defendants, particularly victims of domestic violence and sexual assault who decide to take the law into their own hands. After studying the issue for several years and working closely alongside the victims who have been impacted by this issue, Court Watch has made several recommendations for the DA’s Office and other Orleans Parish law enforcement agencies. For victims of sexual and domestic violence, they urge the DA to completely discontinue the practice of incarceration to threaten and coerce them to testify. For non-sexual and domestic assault witnesses, at a minimum, they recommend the DA publicly release a protocol that includes the different factors an assistant DA should consider before applying for an arrest warrant. “We’re talking from a place of fact, science and data on this issue,” said Councilman-at-large Jason Williams. “DAs in major American cities are starting to use their power to repair their communities, and it is troubling that our DA is hell-bent on inciting further divisions in our society with these types of regressive policies. The effects that such actions have on current and future victims is chilling. The council adopted a resolution urging the state delegation and other city officials to approve legislative initiatives and policies that would create financial relief options for longtime property owners suffering the effects of rising property values. The resolution is in response to the city’s current affordable housing crisis, with approximately half of all households being cost-burdened, or spending more than 30 percent of their annual income on housing costs. Ongoing public and private investment in the city will likely worsen this crisis by increasing property values, and in turn property taxes, escalating housing costs even further and displacing long-term residents. Resolution R-19-63 specifically requests that the state study the feasibility of creating a tax exemption for homeowners whose assessed property value has increased by 100 percent or more in the course of one year. This would provide an exemption from the increased property taxes for those who have owned or lived in their home since 2004 or longer, and those with a yearly income equal or less to 120 percent the area median income. The resolution represents ongoing efforts by the council to ensure that the thousands of low to moderate-income homeowners in New Orleans, especially those who have returned after Hurricane Katrina, are able to remain in their homes and the city they love.